For today's Tuesday Tip, I want to mix things up a bit. About three months ago, I began on quite the adventure. I left one of my homes in Oregon, packed up the family, bought a 30′ RV and left to travel for eight months full time throughout the United States. Now, just to be very clear, this is not an extended vacation, this is a lifestyle. I tell you this because I want you to know that I truly practice what I preach and that living the lifestyle of an online entrepreneur is something that constrains everything I do. I have three businesses as well as several private consulting clients. I'm doing that while living and traveling full time on the road with my wife and three of my four children (the four lives with her mom in Brazil) – yeah, it's a little crazy, but I love it. I'm an automation and business efficiency nut. I eat, sleep and dream this stuff. It's almost a torturous way to live, to be honest. I mean every place of business I go into my mind drifts to the “inefficiency” of everything they do. I'm sure there are one or two of you that can relate… (just one or two, I'm sure – haha). 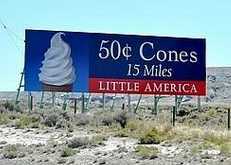 I was driving from South Dakota to Utah and I began to see all of these signs for a 99 cent ice cream. Now I don't just mean a couple of signs, I mean a bunch of signs over probably 40 or 50 miles of highway – all great big roadside billboard signs, sometimes in small clusters of 3 or 4 of them one right after the next. The signs varied, but about 50% of them were this one offer – a 50 cent Ice Cream cone. But there were others as well that spoke to truckers by letting them know that Little America had marble floor bathrooms and showers. There were also signs targeting RV drivers talking about how they had large RV parking and services. The messages were consistent, clear and completely impossible to miss. 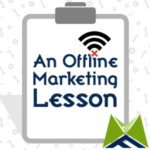 I watched all of this as I drove down the freeway, not just out of curiosity, but with an eye towards learning the many, many marketing lessons being driven into me as I barreled down the road. The Little America truck stop clearly is targeting two specific audiences – travelers (specifically RV owners with kids) and truck drivers. Every single sign that they posted was directed very specifically at one of those two audiences and with very clear messaging that anyone outside of that audience wouldn't get it. Just recently I had a private client tell me that they didn't have multiple segments / audiences on their list. I was patient, but I explained how the law of 80/20 dictates otherwise – it's just simply not possible. I also told them that after years of doing this and consulting with 100's of clients that I had a rule of business that I had uncovered. There are always 3 or 4 primary segments on your list – always – that will account for 80% or more of your list. Now most rules have an exception, but this one really doesn't. If you analyze your list and find that you only have 2 segments, you probably have not gone deep enough. Likewise, if you come back and say you have 23 primary customer types, well, I'm willing to guess that not only do you have 3 or 4 instead, but that likely the 23 you identified are not even naming the 3 or 4 real ones. What I mean by that is that you're likely segmenting in a different way than your primary audience is aligned. What was funny is that after the client really went away pretty determined that they didn't have those 3 or 4 primary customer types, something magical happened. They went on an event with their customers for a weekend and came back with an epiphany. On our next call, not only did they now believe me, but they had clearly articulated the exact three customer types that they had. Now here's where it gets interesting. They were not the original three that we discussed. They were entirely different. At first we thought the segments were age aligned. It turns out that was not at all true, the three primary customer types ended up being interest-aligned. Very different, but very specific and super easy to market to individually know that they are identified. Another client of mine runs a marketing and training company specifically for Dentists. She very clearly has three primary segments that are painstakingly obvious – Dentists, Hygienists and Office Managers. Though she sells to Dentists, often times its the Hygienist or Office Manager that opts into her list. Obviously, she can't close a sale with a Hygienist, so knowing her audiences and marketing appropriately makes everything come together. Little America showed one of the best, most clear marketing campaigns I have seen in a very long time. They know EXACTLY who they're appealing to and they don't mince words trying to appeal to everyone else. A $.50 ice cream cone? Seriously, could there be a better definition of “an irresistible offer”? I don't think so. Yes, I'm being a bit tongue and cheek here, but on another level I'm not. Clearly this offer is designed to appeal to the children traveling with their parents trucking on down the road. It's also designed to appeal to the parents looking for a reason to stop the kids from fighting in the backseat. More subtly it's also appealing to budget-conscious families looking for an “affordable” reason to stop. It's also such a ridiculously affordable price that it's a “no-brainer” offer – that's exactly what you want! You don't want people to have to think about your offer, you want it to be so abundantly clear that it's a homerun that they just do it – no thinking or analyzing necessary. When you can get this dialed in and truly have a braindead simple irresistible offer that is perfectly aligned with your market, well, magic happens. One of the little niches that a partner and I play around in is just such an example. In that niche we have the largest Facebook group on the Internet and the fans are rabid for their product. It's a hobby type niche, so not the easiest in the world to monetize, but when you get your offer dialed in, it's amazing what can happen. For a long time we struggled to find a lead magnet that worked. We tried lots of things but were only able to get around 20% of them to optin. Not a terrible number, but nothing to write home to mom about either. We knew we could double that if we had a better offer. You can still be profitable and do “ok”, but you'll never hit a homerun until you have a super clear and truly irresistible offer. Trust me, you'll know when you do. If you're not seeing numbers North of 40% on your squeeze page, then it means you either don't have the right offer or the right audience. Once you get those tow in complete alignment, magic happens. Getting your message defined and dialed in is vital. But so is making sure that it's actually heard and seen – REPEATEDLY. Let me assure you, while driving through Wyoming, there wasn't much else to look at for about a 25 mile stretch except these billboards everywhere – sometimes in clusters of three at a time. The point is, not only did they work on refining their message and speaking directly to their audience, but they did it over and over and over again – creating a clear and consistent branding as well. So here's where a lot of small businesses really drop the ball. They work so hard to get the sale that they forget that it's more about creating a satisfied client that will come back over and over again than it is about just “making the sale”. Little America definitely “got it” when it comes to this part of the customer experience. Yes, they delivered on their promise of a 50 cent ice cream cone. But the also had very helpful staff that were generally pleasant to deal with, an attendant in the bathrooms handing out towels, an immaculate restroom area with marble floors and individual stalls that were their own, self-enclosed room – floor to ceiling. But they didn't stop there. Everything they did was in that same approach – over-delivering on expectations. Then when you went to pay, it was affordable. Most of these truck stops over-charge for everything and the quality is only marginally passable for human consumption. Little America even went so far as to have a playground area for the kids complete with dinosaurs and other large replica toys of amusement for my one year old to gawk at.